Microsoft's next Xbox LIVE update with Facebook and Twitter support went out to those of us with preview access early this morning, and I've just finished tinkering with it. 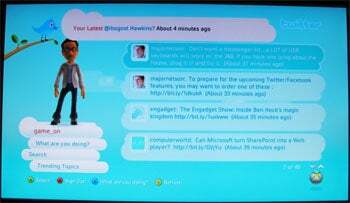 The good news: It's Facebook and Twitter on your Xbox 360. The bad news: It's Facebook and Twitter on your Xbox 360. If you love Facebook and Twitter, you'll love it on your Xbox 360. If you hate Facebook and Twitter...well, you probably avoided clicking the link to read this update in the first place. For the record, I like (not love, just like) Facebook and Twitter. Used as tools to keep in touch with friends, they're lovely. As a way to channel your bad haiku or what you had for supper last night? Not so lovely. I had green bean salad and chocolate cake, for the record (not simultaneously). After you install the Xbox 360 system update, you'll still have to pull the Facebook component down separately. It's a tiny application--less than 10MB--that took only a half-minute to download. After installing itself, a dashboard Facebook rectangle appears at the top of the new "My Community" menu, followed by adverts for services like "Music Monday," "Tuesday Family Game Night," "Classic Costumes," etc. Click on it, and you'll see the following screen while it launches. Here's the thing about Microsoft's Facebook interface: Facebook wishes it looked this slick. Seriously. Microsoft's done a lovely job breaking out the service's most important bits and arranging them in an elegant, pleasingly colored, neatly delineated assemblage of panels. I might have to use this version just to spite the over-busy browser one. The default view drops you in at the news feed, where your friends' status updates cycle every five seconds. There's no option to set the speed, so if five seconds sounds a little speedy, you can click the panel, which drops the news updates into discrete rectangles. From here, you can give individual messages a thumbs up or leave comments. For some reason scrolling between the rectangles causes annoying transitional stuttering, something we'll cross our fingers Microsoft can remedy before launch. Updating your Facebook status couldn't be simpler, either by clicking on the status panel itself, or tapping your gamepad's 'x' button from anywhere within the application. I used an Apple keyboard (not to be impudent--it's just what I had to hand), but any standard key layout USB keyboard (or of course the Xbox 360 messenger kit) should do. That said, I don't care for the way the text interface taps out each letter on the virtual keypad in tandem with you. It's the input equivalent of listening to someone talk and reading what they're saying simultaneously. Any chance detection of a USB or gamepad keyboard could disable the virtual keypad, Microsoft? Viewing Facebook friends and their photo albums is simple enough--just select and tap--but linking them to your Xbox LIVE friend doesn't seem to be working yet. Several of my colleagues have the preview update, but Facebook says "No one to invite! 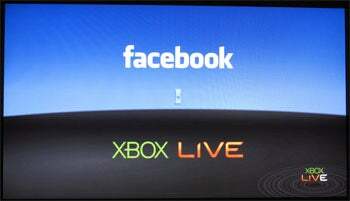 Check back often, and be sure to ask your friends to try Facebook on Xbox LIVE." There's no option to manually add known users either. Were this working properly, you'd see a list of Facebook friends who'd successfully linked their Xbox LIVE accounts, with the option to invite over. Favorite feature so far? Photos, hands-down. With a few taps, I'm able to browse any of my friends' or my own Facebook photos and/or albums. The pictures look perfectly respectable, too. Facebook always compresses and downsizes your uploads, so they're always a bit squirrelly looking online, but they scaled just fine on my 720p LCD TV. What's more, they load quickly and cycle instantly, just as they would were you viewing them with an external storage device offline. Twitter comes pre-installed, though it's strangely relegated to the fifth spot along the "My Community" view list. It works pretty much as you'd expect: A simple, scrollable screen displays the last four updates plus your latest dispatch. You can search for topics, follow new accounts, reply (or direct reply), retweet, or "favorite" a message. Twitter's pretty barebones as it is, making its integration less about functionality than presentation, so if you like cute displays with birds on branches and baby blue backdrops, you'll love what Microsoft's done here. What's missing? I'd still like to see Twitter integrated with the Guide (the menu that pops up when you tap the silver-green button in the middle of your gamepad). It's a little clunky having to drop out of games or movies or whatever else you're doing just to fire off 140 characters. Twittering is something done quickly and usually supplementary to something else, not a primary messaging interface you want dominating your attention. Back with more on the new movie and music features shortly.